Hagenia abyssinica is a highly ornamental tree species with an umbrella shaped crown, and large attractive flowers. Trees are either male or female, with male flowers an orange to brown or white colour and red female flowers. The flower heads form large hanging groups, made up of many small flowers. The colour of the flowers actually comes from modified leaves called bracts rather than true petals. The fruits are small and dried, hidden within the dried part of the flower. This species grows up to 25 m in height. The leaves are pinnately compound reaching lengths of 40 cm; with 11-16 hairy, dark green, slightly serrated leaflets. The bark is reddish brown and often peels from the tree trunk and branches. Hagenia abyssinica has been used for centuries in Ethiopia and has great local importance. It is used locally for its medicinal properties; an infusion of dried female flowers is used to treat tapeworm, the roots are cooked with meat to make a soup for treating general illness and malaria and the bark can be used to treat diarrhoea and stomach ache. The wood is a beautiful dark red making it a popular timber species for furniture, floors and cabinets. Timber is also collected for fuelwood. Hagenia abyssinica is endemic to the Afromontane regions of central and eastern Africa. Despite Hagenia abyssinica being widely distributed, its range is scattered with disjunct populations. 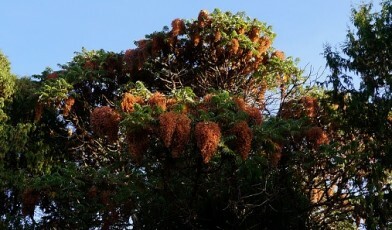 Hagenia abyssinica occurs mostly in the upper regions of montane forests, at 2,300 – 3,300 m a.s.l, often just below the tree line. This species prefers cool, wet climates such as those found in moist montane forests, and can also thrive on rocky sites. Although this species has not yet been assessed on the IUCN Red List, its many uses and loss of habitat mean that populations are decreasing as deforestation continues throughout the Afromontane forests. The Red List of Endemic Trees and Shrubs of Ethiopia and Eritrea notes that Hagenia abyssinica is “of serious conservation concern” in Ethiopia (Vivero et al., 2005). In Ethiopia this species occurs in the Juniper-Hagenia forests of the Simien and Bale Mountains, a forest type found only in Ethiopia. Afrocarpus falcatus and Hypericum revolutum are found growing alongside Hagenia abyssinica and Juniperus procera in these forests, which are also home to endemic species of fauna including the Endangered Mountain Nyala (Tragelaphus buxtoni). There have been previous efforts to bring this species into conservation and propagation programmes, however, due to its increasing rarity and limited cultivation, there is a great need to increase conservation work of this highly utilised species which is a key part of the Afromontane forests.